The Explorer Path Provisioning application is a key component of the Blue Planet Route Optimization and Assurance (ROA) product family. Like the Traffic Engineering application, it leverages ROA’s vendor-agnostic IP/MPLS telemetry and analytics to give network operators powerful automated service provisioning capabilities. 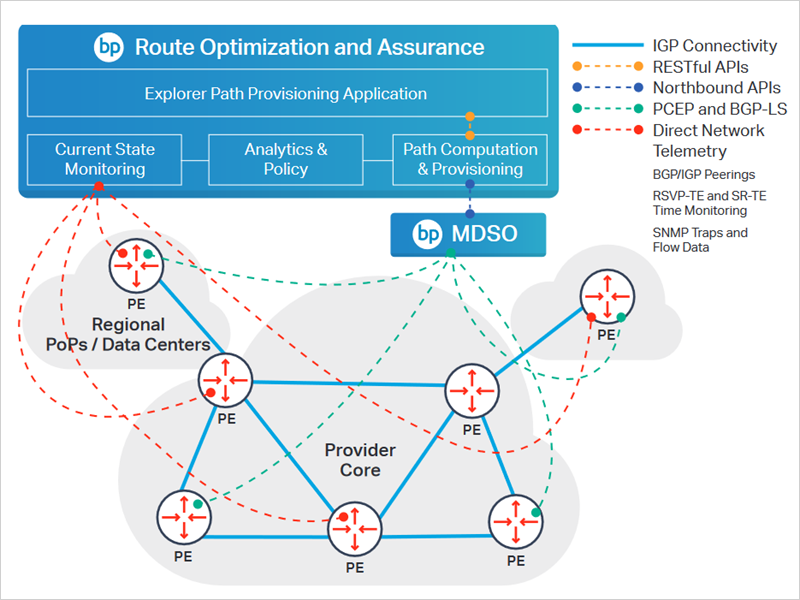 With the Path Provisioning application, service providers can quickly and easily create a catalog of IP/MPLS transport services that, when integrated with an SDN controller or service orchestrator like Blue Planet Multi-Domain Service Orchestration (MDSO), can be used to automate fulfillment of subscriber requests. Constraints may be applied to address a variety of path provisioning use cases, such as diversity, low latency, disaster recovery and data sovereignty. The Path Provisioning application allows network providers to create a catalog of IP/MPLS transport services using an intuitive web-based wizard. Service paths can be created for a variety of subscriber needs, such as low latency, data sovereignty (e.g. to ensure traffic does not traverse country borders) and diversity. Each service can also be defined with its own priority and optimization algorithm to be used for calculating the path, including lowest delay, lowest number of hops, shortest IGP or shortest TE metric. Additional constraints may be applied, if needed. These include the use of RSVP-TE or Segment Routing tunnels, with various path diversity and path protection options, such as the inclusion or exclusion of nodes, links, interfaces, Shared Risk Link Groups (SRLGs), and user-specified affinities with masks. When a subscriber requests an IP/MPLS service path between two end points with a specific set of constraints, the operator simply selects the matching service from the catalog already created and associates it with the subscriber. The operator can then provision the new path by specifying only the source and destination PE devices and the required bandwidth. Explorer Path Provisioning's path computation and optimization engine computes the best path based on the defined constraints, and returns the results within seconds. If it determines that no path is available to satisfy the supplied constraints, the operator can quickly adjust the constraints and re-submit the request. The new path details are presented to the user, including a mini-topology map showing each node in the path. The network configuration changes may then be provisioned manually, or automatically. After the application’s path computation and optimization engine calculates the new path(s) based on the supplied constraints, it returns the results, providing the operator an opportunity to review the details of the new path before sanctioning the required network changes. Once satisfied, the operator may choose to provision the changes manually. Or, they can simply click on the "Provision" button in the application's user interface to pass the configuration changes to Blue Planet MDSO or another SDN controller or orchestrator, via open APIs, to be provisioned automatically. Once the network changes are made, they will be detected immediately by ROA’s real-time routing data collection, completing the closed-loop automated path provisioning. This software-defined control allows operators to transition to a more adaptive network that offers reduced operational complexity, greater efficiency, and improved services velocity.